Corporate America, and even Republican leaders, have warned President Donald Trump that his trade war could end up erasing some of the savings reaped from the sharp cut in the corporate tax rate. Now there’s some evidence of just how much damage could be inflicted. The hit in 2018 from the steel and aluminum tariffs enacted in March is larger than the first-quarter tax savings for General Motors Co., Ford Motor Co. and Fiat Chrysler Automobiles NV, according to data compiled by Bloomberg and estimates provided by Nomura analyst Anindya Das. 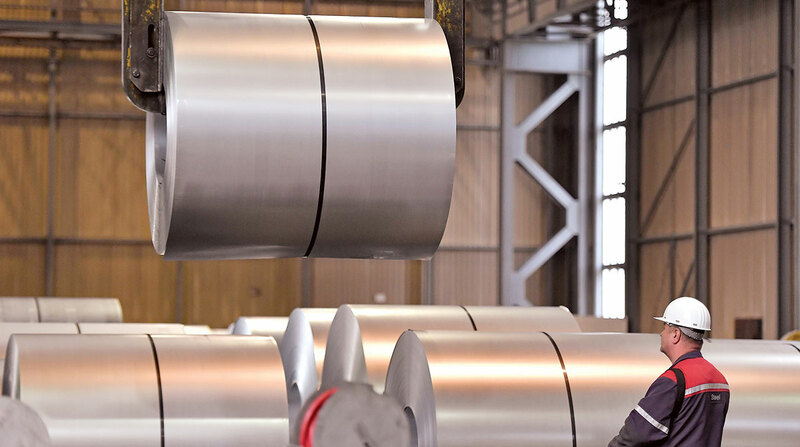 Assuming approximately the same tax savings from a lower corporate rate each quarter, the steel and aluminum tariffs could eat up anywhere from about a third to well more than half of the tax benefits in 2018, the Bloomberg analysis shows. For example, Ford saved about $208.4 million in taxes in the first quarter under a 21% corporate rate applied to its profit, compared to if the old rate of 35% had been applied to the same profit. The steel and aluminum tariffs will cost the automaker about $509 million in 2018, according to Nomura estimates. General Motors’ costs for the year could total $493 million after it saved almost $339 million in the first quarter. And Fiat Chrysler will see almost $100 million more in tariff costs for the year compared to its savings in the first quarter. These figures estimate how the reduction in the corporate tax rate to 21% from 35% is affecting companies’ balance sheets based on first-quarter profits. The calculations don’t take into account other factors, such as depreciation, foreign tax credits or other one-time tax charges or benefits that can alter a business’s overall tax rate. The Bloomberg data takes into account only the effects of the 25% levy on imported steel and the 10% tariff for aluminum — which would be dwarfed by a potential 25% tax on imported cars and trucks that Trump has threatened. The steel and aluminum tariffs are estimated to cover about $48 billion of imports. The United States imported $293 billion of vehicles last year, which would amount to a $73 billion tax increase, according to estimates from the Tax Foundation. The likelihood of the auto tariff could be clearer after the president meets with European Commission President Jean-Claude Juncker on July 25 to address trade tensions. Analysts wouldn’t provide estimates on how American automakers would fare under the 25% levy, because it’s too hard to calculate without knowing whether the United States stays in the North American Free Trade Agreement. Yet there are some evaluations that can be done for the foreign automakers. There is already a tariff on foreign-made cars, but it’s only 2.5%, a tenth of what’s being contemplated. Toyota Motor Corp. and Honda, while based in Japan, pay the U.S. taxes on the income they earn from sales to auto dealers. The vehicles they make overseas and import to sell in the United States as well as parts made abroad but are used in cars manufactured in the U.S. would be subject to Trump’s auto tariffs. Toyota booked a $2.24 billion (249.6 billion yen) tax benefit as a result of the tax law for its fiscal year ending March 31, 2018. All of that could be wiped out by the auto, steel and aluminum tariffs. The company could lose $276 million from the steel and aluminum levies and, at most, another $2 billion as a result of the 25% auto tariff, according to Bloomberg Intelligence data. Toyota’s North American Chief Executive Officer Jim Lentz said earlier this month the Japanese carmaker may stop importing some models or raise prices on others as a result of the auto tariffs. Honda, which received a $3.11 billion (346.1 million yen) tax benefit for the last fiscal year could see combined losses of as much as $820 million following the tariffs. “At a minimum, it washes out the tax benefit,” Gary Clyde Hufbauer, a senior fellow at the Peterson Institute for International Economics, said, referring to the 25% auto tariff. Because the tariffs are expected to be short-lived — undone either by this administration or the next — carmakers are unlikely to alter their supply chains to avoid the tariffs, said Kevin Tynan, an automotive analyst with Bloomberg Intelligence. It will just mean higher prices until the tariffs are unwound, he said. Trump’s tax cuts have fledgling support among voters, but were wildly popular among the corporate community that had pushed for lower tax rates for years. “Trump’s political calculus seems to be that these corporate executives can now take a bit of a bashing and that won’t hurt him politically and it may even help him with some of his constituents,” said Peterson’s Hufbauer. But tariffs may not ultimately prove to be politically expedient. Consumers of imported vehicles will face an average price increase of $5,800 as a result of a 25% import tariff, analysis of U.S. Department of Commerce data shows. “Tariffs are about as close to a no-win situation as you can get,” Tynan said.